From 1950 to 1961 Bruno and Claire Aron owned what is now Ventfort Hall and ran it as a hotel for culture oriented travelers of all races and religions. Festival House was a precursor of many attitudes and activities important to Lenox today. 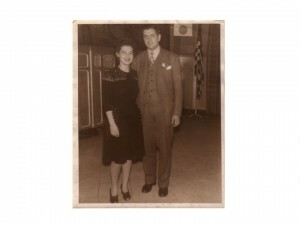 Claire and Bruno were first generation Americans in a family of Eastern European Jewish heritage. They both loved culture and were very concerned with social justice. Bruno left his job at the Pittsfield Jewish Community Center in 1949 and started looking for other opportunities in the Berkshires. 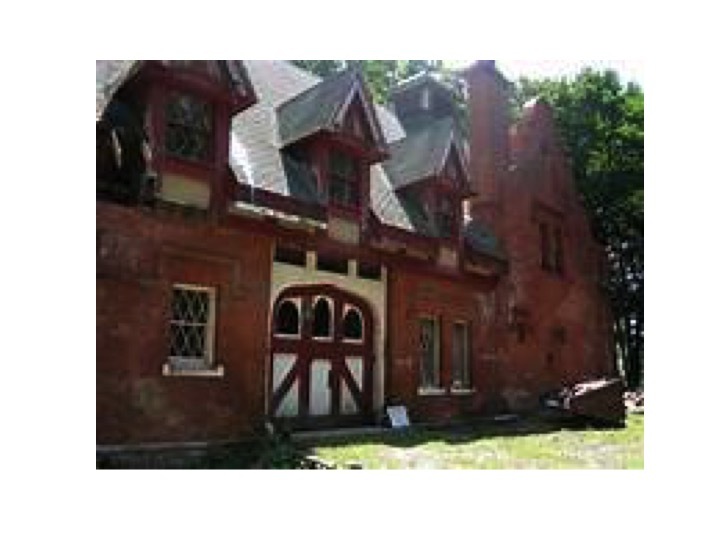 Bruno and his family loved the beauty of the Berkshires and wanted to increase opportunities for others to visit. 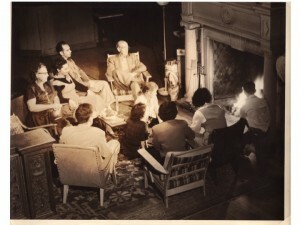 While working at the Pittsfield Jewish Community Center, Bruno was often contacted by Jews traveling to Tanglewood about where they could stay when attending concerts, so he was aware of the discriminatory practices of some lodgers at the time and wanted to create a place that would welcome all visitors. 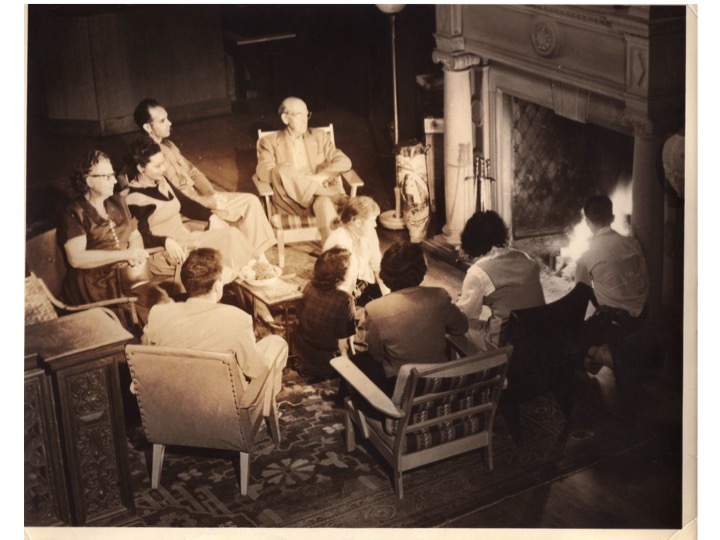 Demonstrating foresight on what was to come, he and Claire also envisioned leveraging the attractions of Tanglewood to make the Berkshires a cultural destination. 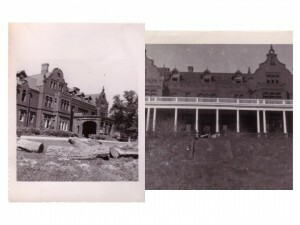 Ventfort Hall, then called Tracy Hall, had not been lived in for twenty years as of 1950 and was in foreclosure. With its proximity to Tanglewood, the Arons thought it would be an excellent way to achieve their vision. 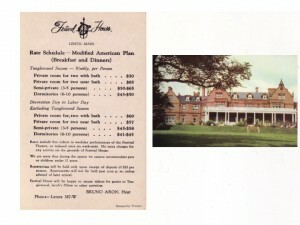 They purchased Tracy Hall in 1950 and called it Festival House. 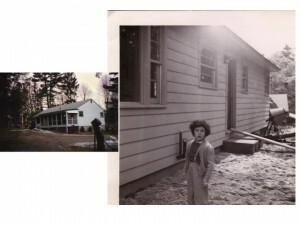 The furnace had to be replaced and the vacant house had to be furnished, but they did manage to open for summer of 1950.
to create a larger, first floor kitchen (previously the only kitchen had been in the basement) and were able to begin offering the kind of affordable culture they had envisioned. 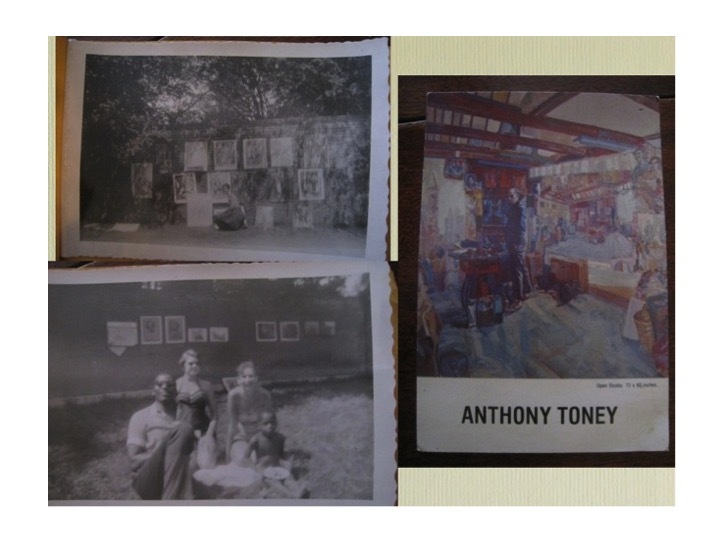 To encourage longer stays and fully realize their vision, Claire and Bruno invited artist Anthony Tony and his family to join them and gave him a free hand in creating an arts program. 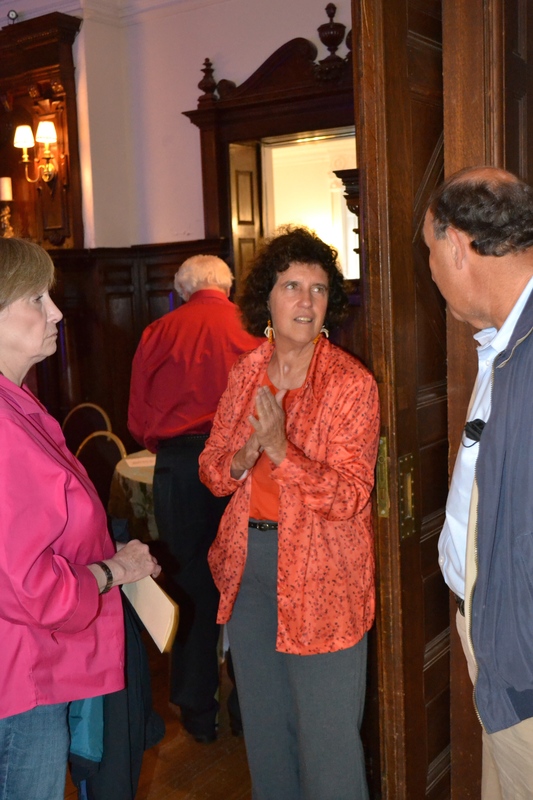 Hotel guests and other Berkshire visitors were given the opportunity to study with a variety of artists as well as to attend art evaluations, sketch groups, trips, life classes and modeling. 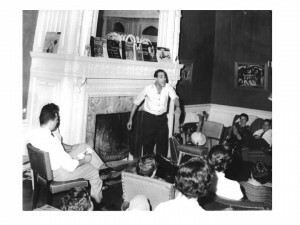 As the reputation and network for the program grew, Festival House saw a constant stream of artists who often displayed their work at Festival House. 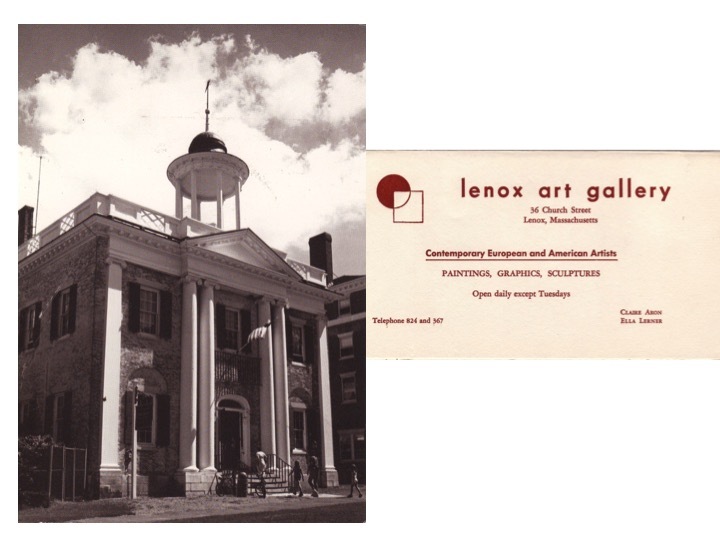 When space became available at Lenox Library for an art show, it became the precursor to Lenox’s (according to the Aron sisters) first art gallery. 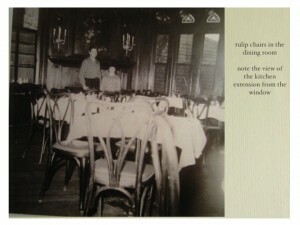 Claes Oldenburg was one of the curators. Crime and Punishment by Dostoyevsky for Russia. some of the actors were seen in town dressed inappropriately. 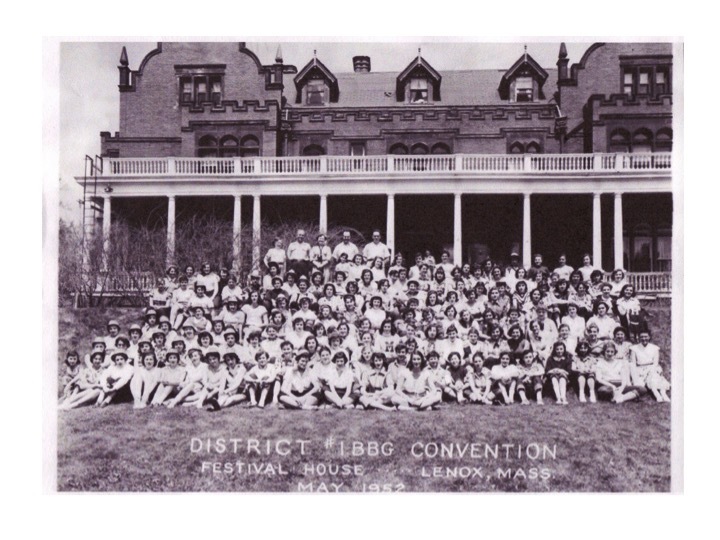 Hard to imagine today, but Madeline recalled this being a time when women who arrived wearing anything other than a skirt were loaned one to wear for the concerts at Tanglewood. 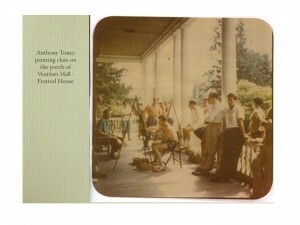 Housing Tanglewood visitors and performers had been part of the original vision for Festival House. Four of he BSO musicians who stayed at Festival House eventually agreed to play twice a week in exchange for room and board. 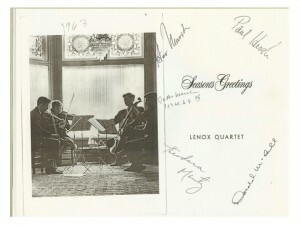 With the Aron’s encouragement they eventually formed the Lenox Quartet. But the music wasn’t limited to classical. The Aron daughters described Festival House as a “Hopping Place.” Some nights there was classical music in the lobby, folk dancing in the main lounge, folk singing in the library and drumming on the back porch. venue. 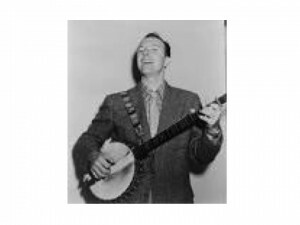 Performers included Pete Seeger, trumpeter Dizzy Gilespie, jazz pianist Randy Weston and singer Odetta. 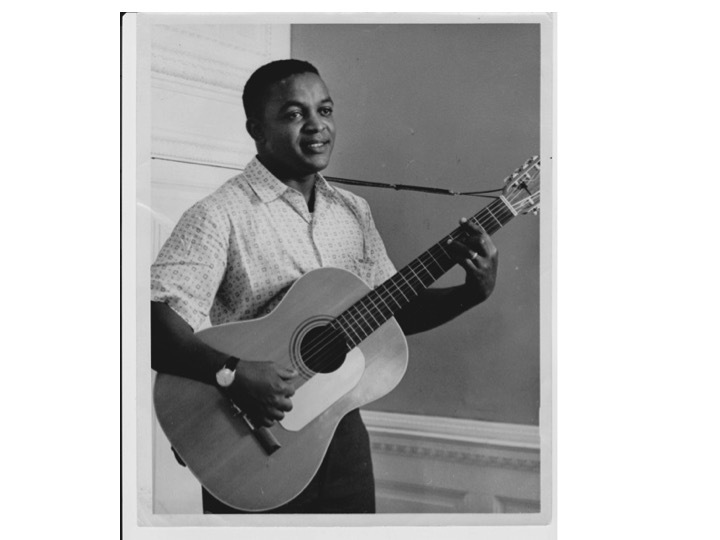 Irving Burgie, pictured here, regularly played calypso and wrote songs picked up by Harry Belafonte and the Kingston Trio. In addition to the performing arts, there were lectures on the lawn and fireside chats. To create further inducements for longer stays, the Aron’s added a pool in what had been the Italian garden. They turned the gardener’s tool shed into a snack bar. 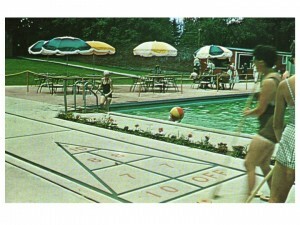 it was one of the first pools in Lenox. 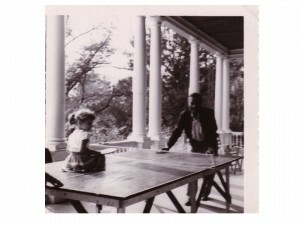 They also installed a tennis court and had a ping pong table on the back porch. 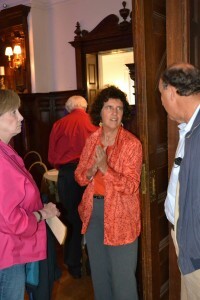 Dining included breakfast, dinner and boxed lunches for Tanglewood performances. 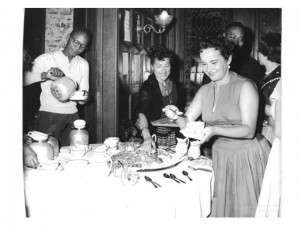 The Aron daughters report their father considered the box lunch a new innovation. Another part of the Tanglewood tradition at Festival House was the presentation of baked Alaska for guests returning after concerts. To increase revenues, the Arons rented the property off season (initially the Tanglewood season was only four weeks long). 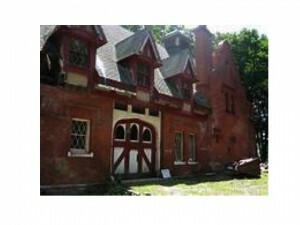 They also let the youth hostel network use the carriage house. on Walker St. (across the lawn from Festival House), so they didn’t have to heat the big house all winter and to provide some family space during the summer. Previously they had lived in an upstairs bedroom at Festival House that had been converted into an apartment . across the street for staff and overflow guests. 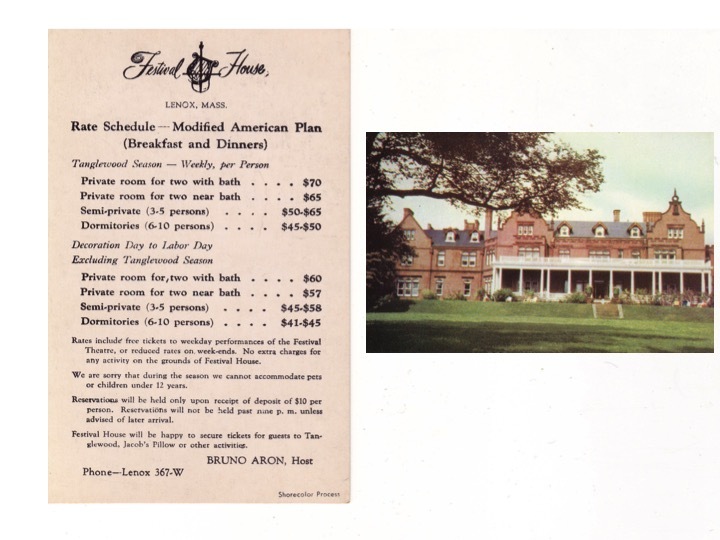 They called the property “Sunnybank,” and continued to operate it as a guest house for several years after they sold Festival House. 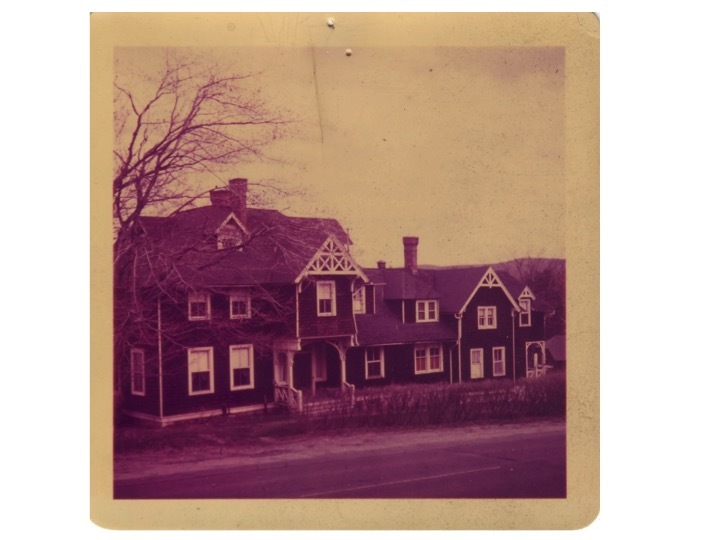 By 1961 a number of new venues had come into existence – including Music Inn – and the Arons felt that their goals of opening up the Berkshires had been achieved. 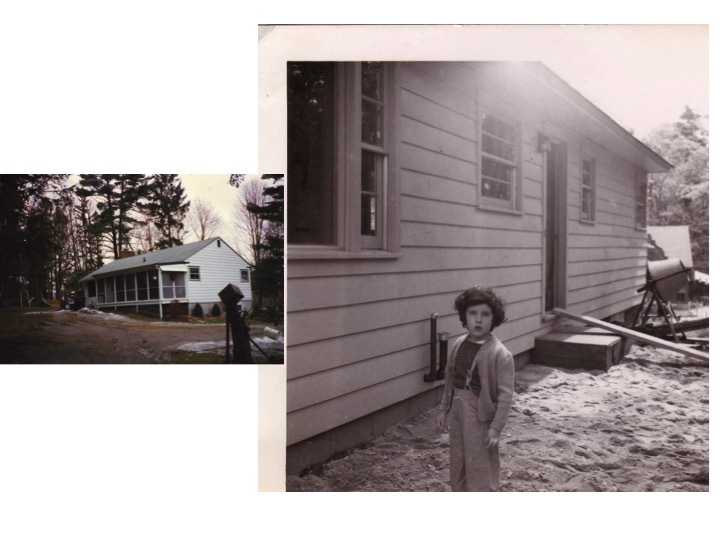 They also wanted to allow Bruno to stop having to commute to New York (where he worked selling Israeli bonds), to provide better care for Claire’s rheumatoid arthritis, and to give Madeline and Judith more options for schooling. So they sold Festival House and moved to New York city. What would eventually return to being Ventfort Hall then became, for several years, the home of the Folkine Ballet. 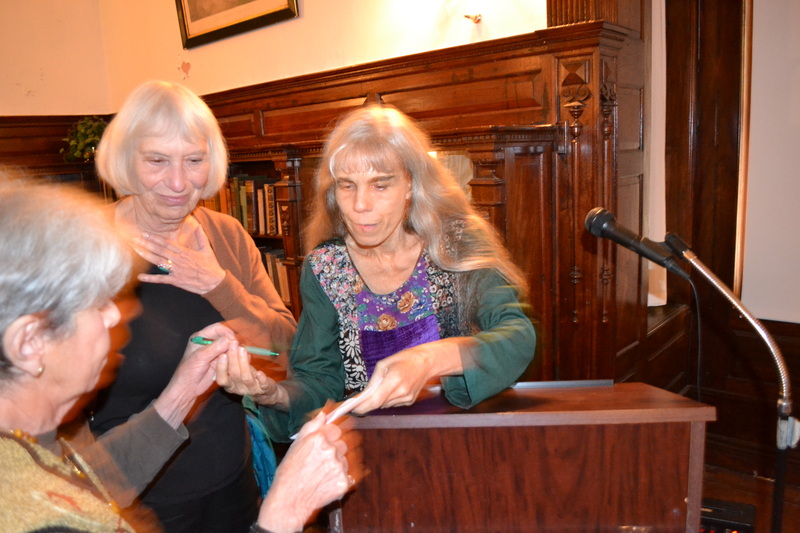 All of the above is with thanks to Madeline and Judith Aron (Lite) who gave a lecture at Ventfort Hall Oct. 11, 2014 on their experiences as children at Festival House. 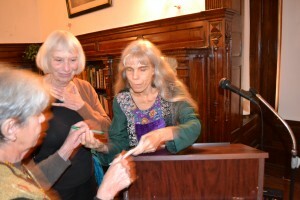 See You Tube –Lenox History Channel for 3 videos capturing most of the talk by the Aron daughters.